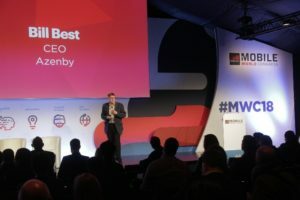 Our CEO Bill Best was amongst four Azenby people at MWC 2018. Here are his observations of the event. not one of those first pioneers, but I have attended quite a few, probably over 20. This year I had the pleasure to moderate a panel session on mobile edge infrastructure. More on that later. I was one of the 108,000 people attending this year and if I wanted to visit to all the 2,300 companies exhibiting I could have spent 1 second with each (excluding travel time between stands) so I decided to be selective and plan ahead and work out who should have the pleasure of me visiting their stand. Traditionally, companies would use MWC to announce new products but we see a lot less of this happening these days. I think this is because there is so much noise surrounding MWC that it is hard to be heard unless you are a Samsung and indeed nearly all the talk and certainly the press talk was about their new Galaxy 9 range. This device is all about media, all about images, videos, and emojis. About post picture processing (do I smell the beginning of the end for Photoshop?). I think it supports communication as well. Not sure though, this aspect was never mentioned. Thanks again to Mobile World Live who reminded me that back in 1987 someone called Nokia turned up and announced their new handset, the Cityman 1320 which weighed one kilogram, had an 8-hour charge time and 30 minutes of talk time. This year Samsung unveiled the new Galaxy 9 with a slightly different specification, but these two devices retailed at about the same price in their relative eras. Amazing that. Just to put a dampener on Samsung’s show, The GSMA the device of the year in the Global Mobile Awards went to Apple X. I read that Samsung sell two Galaxy devices for every one Apple phone sold. You pay your money and make your choices! Talking of choices, full marks to HMD (those guys who own the Nokia handset brand) who had a good go at grabbing some of the device attention away from Samsung by unveiling five new phones including a remodelled 8110 and the premium Nokia 8 Sirocco. I saw a forecast saying that there will be a growth of one billion mobile connections from now until 2025, mostly in developing markets like Bangladesh, China, India, Indonesia, and Pakistan, as well as markets across Sub-Saharan Africa and Latin America. Looking at that new one billion mobile customers, I think few will be Apple X and Samsung 9 buyers, so maybe we might just see the re-emergence of Nokia, at least in those developing markets. Enough about devices. To more important matters; 5G. There were enough stats flying around MWC this year to keep the most ardent anorak happy for a year. One report said that it will be 2025 before 4G accounts for half of all global connections and that seems a long time to me. We will see commercial launches of 5G this year but whether these will be fully 3GPP compliant is a doubt. In the same time frame – 2025 – 5G will account for less than 15% of connections. I am underwhelmed by these projections. Perhaps this is because Operators were lining up to say ‘no 5G business case’ (intended for the ears of the vendors), and the vendors were saying ‘massive new revenues’ (intended for the ears of the Operators and Service Providers). The business case for an MNO does appear challenging unless they can monetise data and not just shift it. Maybe the focus is not so much on us humans now and the march of the machines and IOT is catching the attentions of the Service Providers. 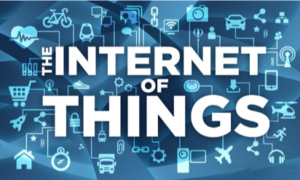 GSMA Intelligence is forecasting the number of IoT connections (cellular and non-cellular) will increase more than threefold by 2025, reaching 25 billion. So, it is not surprising that 23 mobile operators have commercially launched 38 mobile IoT networks worldwide across using the NB-IoT and LTE-M standards. With the remarkable claim from last year’s show that roaming charges would be abolished being conveniently forgotten and brushed under the carpet, GSMA Chairman, Sunil Mittal, this time round called on mobile network operators to seriously consider the NetCo model, a consortium-like approach to network building. Now at Azenby we will say ‘great idea but we were there 10 years ago!’ Azenby has been heavily involved in over ten major RAN and Net share projects around the world in the last five years alone. I think MNOs of all types and sizes are now all fully aware now that infrastructure sharing is a necessity of business life and more than that, their existence depends on it. The final catalyst for this conversion in thinking is 5G and no MNO sees a case for competing 5G network infrastructure. 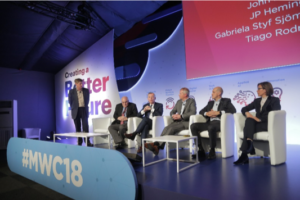 Further evidence of this came from the announcement that five of the world’s largest operators have formed an alliance with the goal of driving forward the development of a more open, smarter generation of radio access network. The ORAN Alliance comprises AT&T, China Mobile, Deutsche Telekom, NTT DoCoMo and Orange, and combines previous groups the C-RAN Alliance and xRAN Forum into a joint, operator-led effort to help shape the next generation of radio access networks. I think Vittorio won on points. He finished by saying “here you have a national player who says that a competitor should not buy a regional cable company because this creates some kind of threat to something. If you follow that logic, then DT should be split in two – perhaps an east and west Deutsche Telekom.” Ouch! What’s really eating DT here? Its my favourite topic that content is king. DT worry about a cable monopoly. Vodafone Germany already owns Kabel and if you add Unitymedia, (Liberty Global’s German cable company) you can see a dominant force in converged fixed-mobile services, exactly the area that DT says they want to own. The cynic in me thinks that if DT want to block it they will need to make only one call to the regulator! Vodafone expansionism was not confined to cable and TV though. They said they are going to build a base station on the moon. Cue the thousands of tweets saying ‘can’t they build one in [enter your post code here]. They should have seen that one coming! This was interesting though. 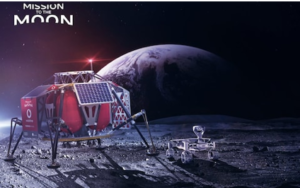 It’s a mission by German engineering and science company PTScientists, which – together with Vodafone Germany and carmaker Audi – aim to complete the first privately funded moon landing in 2019. Vodafone said the 4G network will allow Audi vehicles on the moon’s surface to send data and live HD video streams of footage from the area around NASA’s Apollo 17 lunar roving vehicle, which was abandoned on the surface in 1972. The operator expects the network to be able to support 4G using the 1800MHz frequency band. It got me wondering about spectrum license charges on the moon! Yes, there were 2,300 companies at MWC this year but a few noticeable absentees. The GSMA say that the global value of the mobile industry is $9.1trillion (2013 figures – I haven’t seen them updated since). Let’s call it $10 trillion today. The combined market valuation of Apple, Google and Facebook is $2.89 trillion. These aren’t like for like figures I know but the point I wish to make is that these guys plus Twitter, Instagram and Snapchat, must make up a very sizeable proportion of the globalmobile economy – yet none of them were at the Mobile World Congress. Perhaps the World in MWC excludes the USA! I’m no longer chairing the judging panel for the GloMos as we now call the GSMA Global Mobile Awards but I did pop in to see some of the award ceremony and Huawei cleaned up at the GloMos. Another sign of the times. I had the great pleasure to facilitate a session called ‘Owning Edge Infrastructure: Burden or Opportunity’. The session was very interesting, and it was hard to disagree with the underlying conclusion that with data likely to grow at exponential rates, we need to put more content and more control at the network edge. The very driver for Multi-access Edge Computing. I actually think this is one to watch and throws an additional challenge to be overcome in RAN sharing. Azenby had four people at MWC this year checking out what’s hot and deciding what’s not so hot. We have vast experience in the mobile world offering consulting and advisory services across the whole industry, so if you have a problem, just call on the Azenby team. Feel free to contact us.